The United States Mint first made the 2011 American Gold Buffalo available on March 14, 2011. This was the first date that authorized purchasers could place orders for the bullion version of the coin. Featuring James Earle Fraser’s classic design for the Buffalo Nickel, the bullion and collector releases of the series continue to be popular with collectors and precious metals investors. Each coin is struck in a composition of 24 karat (.9999 fine) gold and contains one troy ounce of gold content. Bullion versions, struck at the West Point Mint without a mint mark, are distributed through the US Mint’s authorized purchaser network based on the market price of gold plus a mark up. Collector versions, bearing the “W” mint mark, are sold directly by the United States Mint at established prices that can fluctuate weekly based on the average price of gold. For the current year, the US Mint intends to release a one ounce proof version of the coin for collectors. The release date for the 2011 Proof Gold Buffalo is currently scheduled for May 19, 2011. This will represent the third year that the US Mint will only offer a single version of the coin for collectors. For the 2008 Gold Buffalo coins, the US Mint had released eight different coins across two finishes and four sizes. Although these coins have gained success on the secondary market, low sales during the period of availability caused the US Mint to discontinue the additional offerings. 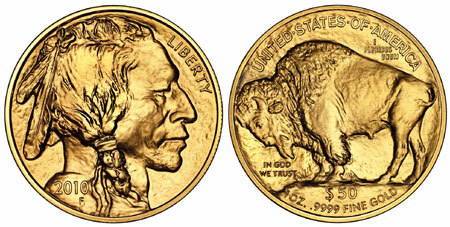 Availability of the bullion versions of the Gold Buffalo has sometimes been erratic. In recent years, the coins have been released late and had sales end abruptly without advance warning. This limited availability has sometimes resulted in higher premiums compared to other bullion products. For the 2011 Gold Buffalo bullion coins, the US Mint made the coins available earlier than previous years, hopefully signaling the start of a better pattern of availability.